This paper evaluates the potential contribution of both trade and business facilitation measures to trade and export competitiveness, as well as the potential gains from adopting a more integrated and coherent approach to trade and business (investment) facilitation. The analysis confirms that measures aimed at reducing the behind and at-the-border cost of exporting, such as reduction in customs and port fees and charges and improvement in transport infrastructure and logistics services can be expected to have a significant impact on trade. However, it also reveals that improving the domestic business (investment) environment may have an impact on export competitiveness of a magnitude similar to the trade and transport facilitation measures. 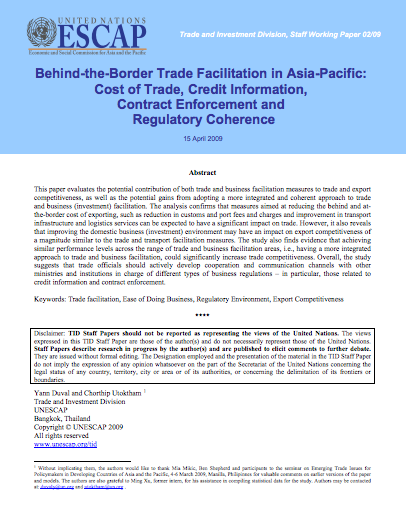 The study also finds evidence that achieving similar performance levels across the range of trade and business facilitation areas, i.e., having a more integrated approach to trade and business facilitation, could significantly increase trade competitiveness. Overall, the study suggests that trade officials should actively develop cooperation and communication channels with other ministries and institutions in charge of different types of business regulations – in particular, those related to credit information and contract enforcement.